While most of the attention of the news media is on Barack Obama's quest to destroy Syria, dark things are afoot in Germany. Two weeks ago, the German government forcibly kidnapped four children from their home over the unforgivable crime of... homeschooling. Last week, the modern SS took 40 children from their homes in a small religious community, presumably over allegations of abuse. (I guess it could have been worse -- at least the children weren't murdered by their government, as occurred in Waco, Texas over a decade ago.). These recent attacks are not new behavior for Germany. The German tradition of compulsory state education has a long history and has spread across the world, as we may cover later. This is a chart for the German government raid on the Twelve Tribes children. The time of the assault was reportedly between 5AM and 6AM, local time, so the chart here is for 5:30AM. 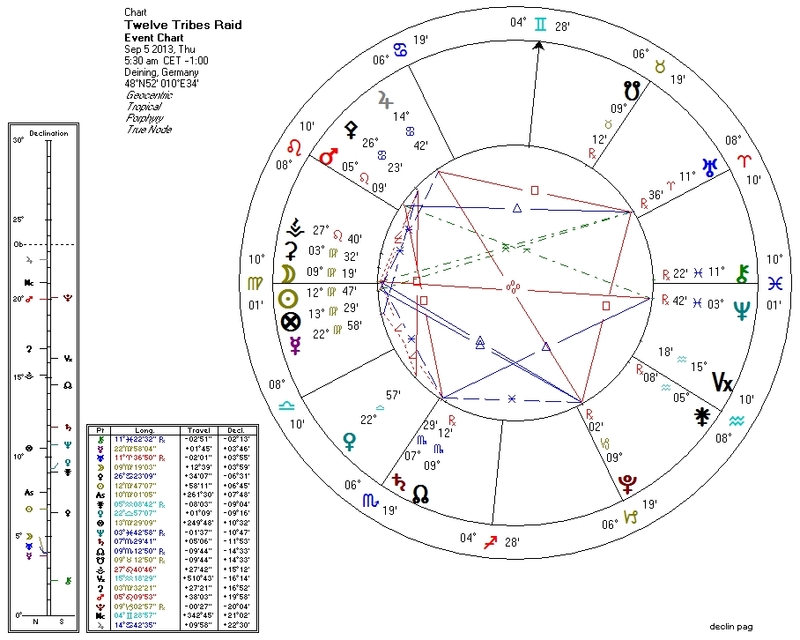 Pallas: We might expect the planetary ruler of ethics in the horoscope to be compromised for this chart. Indeed, she is. While the Sun is contraparallel Pallas (no doubt assisting in current efforts against a US-Syria war), Pallas is also quindecile Pluto and ruled by the Moon which is tightly trine Pluto. Pluto: Pluto sits in the 5th House of children, bringing trauma. He opposes Jupiter in Cancer in the 11th (ruling the 4th house of family), perhaps representing the destruction of family and religious community. He trines the South Node on the 9th House cusp, lending destructive power to loss sustained by the religious community. Neptune: Neptune and Chiron are setting in this chart, perhaps representing (in a different way) loss and pain related to relationship. Neptune is trine Saturn, ruling the 5th House of children, echoing their disappearance into the nebulous netherworld of the State. Moon: The Sun and Moon are conjunct and rising on the chart, very much a focus of the chart, representing home and family. Neptune-the-thief is opposite the pair, and Pluto-the-killer is trine with them. Little is written about how to interpret Ceres, but here she is conjunct the Sun and Moon and is sadly appropriate. In mythology, of course, Ceres is the grieving mother of Persephone who is stolen away from her by Pluto, lord of the underworld.